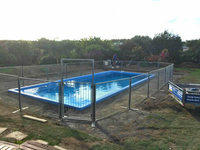 Temporary fence feet, also known as temporary fence blocks, temporary fence base and temporary fence plastic block, is a stable support for the temporary fence. 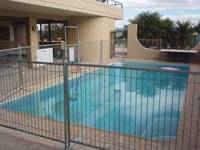 We are able to provide three types of the temporary fence feet, plastic moulded temporary fence feet, rubber fence feet and metal temporary fence feet. 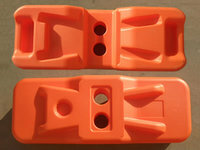 Plastic moulded temporary fence feet including injection moulded temporary fence feet, blow moulded fence feet and two-part blow moulded temporary fence feet. Easy and safe for storage and transport. 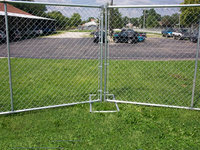 Can withstand the harsh conditions of your work sites. Cost effective and Eco friendly. Entire concrete is encased in plastic and will never fall out. suitable to 25 mm, 32 mm, 38 mm, 42 mm and 48 mm OD fence post. 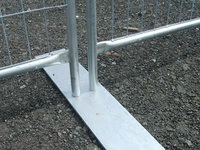 TFF-1: Injection moulded temporary fence feet is easy to install and can infill any materials. 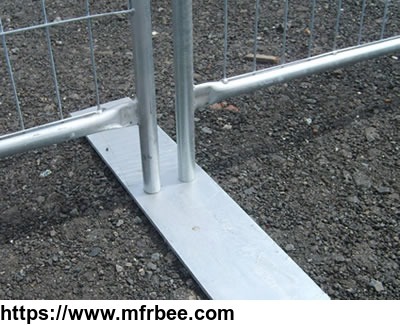 TFF-2: Blow moulded temporary fence feet can be fulled with concrete are extremely stable. 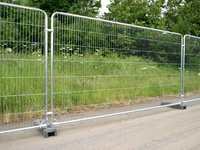 TFF-3: Two-part blow moulded temporary fence feet can be used in uneven ground. Materials: environmentally friendly recycled rubber. Dimension: 760 mm (L) × 200 mm (W) × 130 mm (H). Hole size: suitable to 32 mm OD pipe. Weight: 18 kg (± 1 kg). Color: black, gray, orange or other colors as your request. Features: durable, environmentally friendly, easy to handle, withstand harsh climate. 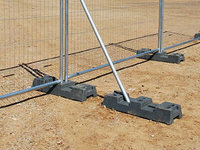 TFF-4: Rubber temporary fence feet are environmentally friendly and easy to install. 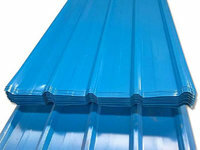 Surface treatment: galvanized, PVC coated with powder coating or painting. Hole size: suitable to 25 mm, 28 mm, 32 mm, 38 mm, 42 mm, 48 mm outside diameter posts or as your request. 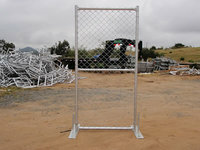 TFF-5: Square type temporary fence metal feet. 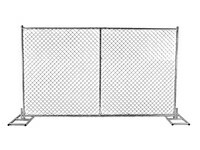 TFF-6: Oval type temporary fence feet. 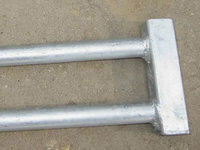 TFF-7: Metal feet with one peg can be used at the end of the fence. 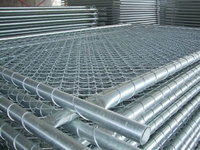 TFF-8: Flat temporary fence metal feet are usually used for Canada temporary fence.